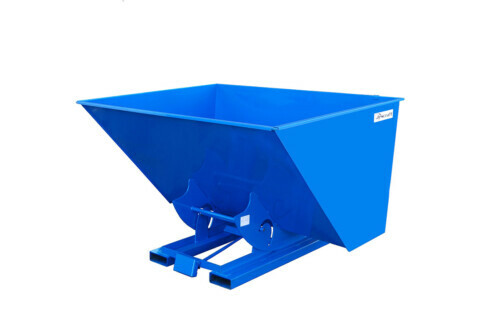 The DHM Series Self-Dumping Mobile Hopper makes handling commercial or industrial waste or bulk material easy and efficient. The DHM Series Self-Dumping Mobile Hopper makes handling commercial or industrial waste or bulk material easy and efficient. Constructed of 12 gauge steel, this mobile hopper is designed for strength and durability for handling heavy bulk material or debris. This hopper features casters and useable forklift pockets for easy mobility for collection of debris and forklift dumping to empty contents. Conveniently dump contents from the seat of a forklift with the manual release cable. The spring-loaded latch secures the hopper in the upright position for filling. Once the latch is released, the hopper tips forward to empty debris. All hopper units include a safety chain to secure the hopper to the forklift. Useable forklift pockets (6.875″ W x 1.875″H) on 28″ centers. Choose from two different caster types specific for your jobsite. CAUTION: The hopper must be attached to forklift when dumping. OSHA requires contacting the manufacturer of your forklift to request specifications for the use of any forklift attachments to ensure your equipment has the adequate capacity to handle the desired load. Refer to your forklift operator manuals for more information. Product images shown are for illustration purposes only and may vary from actual product.